A Christmas Treat for you! A Child’s Christmas in Wales is a prose work by the Welsh writer Dylan Thomas. Originally emerging from a piece written for radio, the poem was recorded by Thomas in 1952. The story is an anecdotal retelling of a Christmas from the view of a young child and is a romanticised version of Christmas’ past, portraying a nostalgic and simpler time. If you like it, may I suggest that you buy a recording of Dylan Thomas reading it himself? It’s on iTunes (though iTunes won’t sell you the single track; you must buy a whole album of Thomas’s poetry for $6) and here is the single track on Amazon for only $.89! http://www.amazon.com/A-Childs-Christmas-In-Wales/dp/B00491RONM/ It’s a wonderful recording. It’s a permanent part of my “Best Christmas” playlist. Merry Christmas, everyone! I hope you get plenty of Useless Presents. Go ahead and lace your tea with rum; it’s only once a year. P.S. I worry that the joke of “Snakes and Families” and “Happy Ladders” is lost on Today’s Youth… The real games were called “Snakes and Ladders” (you might know it as “Chutes and Ladders”) and “Happy Families“. Now you know. Dan and I went to the art museum yesterday to see the Toulouse-Lautrec exhibit again. (Henry was recovering from a sore throat, so he stayed home). Hm, I thought for sure I wrote a blog post about this exhibit (I’ve seen it three times now) but I can’t find one, so I guess I only imagined writing it. Our museum owns a complete collection of Toulouse-Lautrec’s posters (as well as other works) but they are so fragile that they are stored safely off-exhibit most of the time. The last time they were displayed here was back in the 80s, I believe. So this is a really rare chance to see them all. The exhibit was supposed to end on December 12th, but it was extended to December 31, thank goodness! 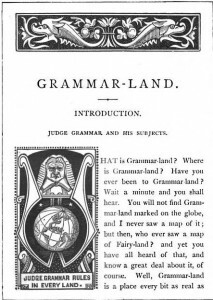 Judge Grammar is far mightier than any Fairy Queen, for he rules over real kings and queens down here in Matter-of-fact-land. 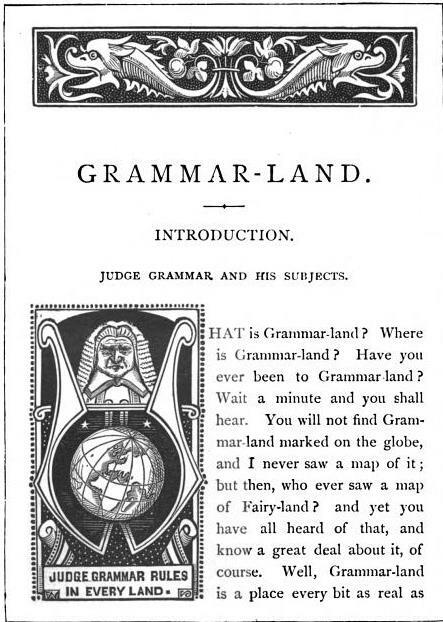 Our kings and queens have all to obey Judge Grammar’s laws, or else they would talk what is called bad grammar; and then, even their own subjects would laugh at them, and would say: “Poor things! They are funny fellows, these nine Parts-of-Speech. You will find out by-and-by which you like best amongst them all. There is rich Mr. Noun, and his useful friend Pronoun; little ragged Article, and talkative Adjective; busy Dr. Verb, and Adverb; perky Preposition, convenient Conjunction, and that tiresome Interjection, the oddest of them all. This is completely unrelated except for being another thing I’m proud of, but 300 people have downloaded our little German book!